I won’t be wrong if I say that Opera browser provides a much faster surfing experience when compared to other web browsers. Android client of Opera i.e. Opera Mini is lightweight, easy to use & no doubt faster than other mobile versions of top most browsers. Recently, Opera Mini got updated with lots of features, and the users loved most of them. The feature that I loved the most was VPN or Virtual Private Network. Yes, now you don’t need to buy a VPN client to stay anonymous on the web. Till now, we all were using either some free VPN services or paid clients but after the addition of VPN with Opera Mini, everyone can have secure & reliable browsing experience without spending a single penny. If you’re not aware of VPN, then let me explain it first. A VPN or Virtual Private Network is a way to add privacy and security to your online browsing. It can also be used to unblock websites restricted at any place. Earlier, some social media sites including Facebook and YouTube were blocked in Pakistan then at the time VPN was the only option left for the people to access these websites. Whenever you try to access Spotify from other countries, expect the United States then an error message will appear which will not allow you to open it. To resolve this error message, you can use VPN. It will hide your original IP address and set a virtual one to stay anonymous, and access blocked websites. That’s what Opera Mini VPN does; it will mask you original public IP and allows you to surf securely. Now you don’t need to download and install any third party client. However, people have claimed that Opera Mini leaks their IP address and location sometime. It just means that your original location and IP address is not hidden from the websites you are browsing. But don’t worry, here’s a solution to fix IP leak in Opera Mini browser. It’s not any hack or vulnerability. There is an extension named WebRTC Leak Prevent, it allows us to resolve IP leak issue. Install this extension in your browser. Go to Menu>>Extensions>>More Extensions. You can use shortcut key Ctrl + Shift + E alternatively. There you can see all the installed extensions. Search for WebRTC Leak Prevent and click on Options button. Here you will find a drop-down list next to IP handling policy. 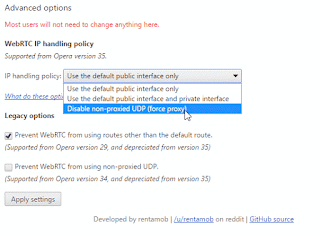 Now expand the drop-down menu and select Disable non-proxied UDP (force proxy). That’s it. Now VPN won’t leak your IP address information to other sources over the Internet. You will come across this issue in not only Opera’s VPN rather most of the VPN clients somehow send your personal data to online websites. So it’s always required to do some manual setting to overcome this error. Otherwise, your data won’t encrypt and can be stolen by the hackers. If you are looking to unblock sites on other devices, or protect all of your traffic and not just Opera, have a look at the VPN review by The VPN Guru.